A common requirement is the selection of some number of elements at random and without repetition from a larger group. This could be to select raffle winners or door prize winners. It could also be to select random employees (or athletes) for a drug test. It could be to randomize the list of questions in a test. Of course, there are other applications of this technique. The example used to illustrate each of the methods below is the selection of 3 employees from a group of 10. Of course, this example is easily extended to select m entries from a list of n elements, where m <= n.
There are several different ways to select elements at random without repetition in Excel. Some of the techniques generate a static list in the sense that the list changes only when the user explicitly requests a change. Other techniques yield a list that changes each time Excel recalculates the worksheet. And, there is one technique that some believe to generate static random numbers but as we will see it is only pseudo-static. There may be instances where we want the list to change each time Excel recalculates the worksheet. In addition to applications such as running a simulation, these techniques also serve as building blocks for those used to generate static random numbers. One of the techniques shown below is a worksheet-only approach and the others are all VBA-based. On many occasions it is important to generate a static random selection, where a static random number is one that changes only when the user wants the change to occur. This could be because all thetasks associated with the list must be completed first. An example would be carrying out some sort of test for each of the selected elements. It could also be that we never want the list to change as in the case of selecting lottery winners (or raffle winners or winners of door prizes). Another possibility is that we want to keep the list static until we complete some sort of audit based on the selected items, as in the case of a financial or accounting audit. The advantage of this method is that the process of regenerating a new list is as easy as recalculating the worksheet (on a Windows machine, pressing the F9 key). The disadvantage is that as soon as a recalculation is done, the previous result is lost forever -- unless, of course, it was saved somewhere else. Suppose the group from which the selection has to be made is in A1:A11. Then, in the adjacent column, enter the formula =RAND(). In the next column over, enter the formula =INDEX($A$2:$A$11,RANK(B2,$B$2:$B$11)). Copy C2 down to cover as many cells as desired selections. There are three procedures described below. Each is a variant of an efficient single-pass algorithm for generating a random selection from a specified list. A worksheet range contains the list from which the random selections are made. The code below goes into a normal module. The function RandomSelection is then available for use in a spreadsheet. Typically, the function should be used as an array-formula. The function takes a single argument, a worksheet range from the random selections are to be made. How many selections depends on the number of cells selected for array-entering the function. "Function can be used only in a single contiguous range"
"Selected cells must be in a single row or column"
"Range specified as argument must contain more cells than output selection"
This is a variant of a single pass algorithm that generates Amount random numbers from a list of numbers with the lowest number specified by Bottom and the highest number specified by Top. While this can be used as a UDF, the more likely use will be to call it from another VBA procedure. As a UDF, it would be used as in =TMOptRands(11, 20,5), which returns 5 random numbers from the set (11, 12,...,19, 20). This is a variant of a single pass algorithm that returns N random elements from the contents of Arr. The same array is used to return the numbers and can be reused to create another list. The N random numbers are returned in the lower N array elements. The advantage of using the method described below is that changes in the random result is totally under your control. The disadvantage is that one must do a sort each time one desires a different set of results. 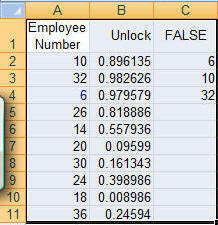 Now, sort the two columns (Data | Sort...) and pick the employees appearing at the top. A very powerful technique for selecting random elements in a static manner is to use "iterative calculations." Under normal circumstances, an Excel formula in one cell cannot refer that cell itself. Excel will warn the user about the circular reference. In the example below, the formula in H10 is a simple =H10. The way to have a formula in a cell reference the same cell is to enable Iterative Calculations. In Excel 2007, select Office Button | Excel Options | Formulas tab. In there check 'Enable iterative calculation' and make sure Maximum Iterations is 1. In Excel 2003 (or earlier) select Tools | Options | Calculation tab to access the same options. Once iterative calculations are enabled, we will adapt the earlier RAND-and-RANK approach to generate a static random list. The layout below looks nearly identical to Figure 1. The difference is the 2 cells B1:C1. C1 will serve as a trigger to generate a new random list. If C1 contains TRUE we want a new list. If it is FALSE we want to maintain the current list. We will (re)use a subroutine we developed above, RandomSelect. What we need is another subroutine that will validate the selection and for valid data call RandomSelect with the correct arguments. The earlier application of the RAND and RANK functions resulted in a solution that changed each time Excel recalculated the worksheet. This was because the RAND function is "volatile," which means that it returns a new value each time calculations are redone. In the subroutine-based solution below, we use the same RAND and RANK functions except that this time the RAND function is used only temporarily. Once the worksheet recalculates once, the value of the RAND function replaces function itself. Start with the setup in Figure 1 above. Next, select B2:B11 and run the code below. The results in column C will change but will remain unchanged no matter how often one recalculates the worksheet. To get a new set of results in column C, select B2:B11 and rerun the subroutine below. Unfortunately, the above function is not truly static since it will recalculate when the user forces a full recalculation with CTRL+ALT+SHIFT+F9.